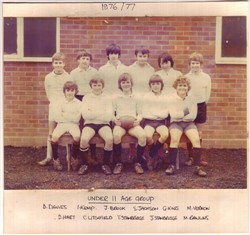 Olney RFC, Under 11 Age Group, colour team line-up photograph and information, season 1976-77. Back row: D. Davies, I. Kemp, J. Brock, S. Jackson, G. King, M. Vernon. Front row: D. Hart, C. Litchfield, T. Stanbridge, J. Stanbridge, M. Rawlins.